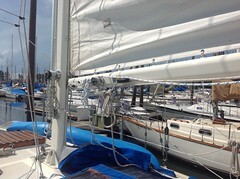 Konami – Small Wave, in Japanese, is a 1977 Westsail 32. 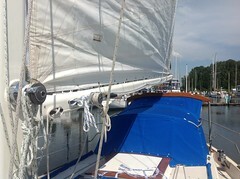 With the bowsprit and boomkins, she is 40′ overall. Hull number 742. She has a Perkins Prima M50, a large engine that can easily plow through strong head winds and steep chop if, she has to. 65 gallons fuel capacity, and 98 gallons of fresh water in stainless steel tanks. Konami is outfitted with a Monitor Wind vane for self steering, an auto pilot that works well but gets confused under sail in zero wind. Garmin radar and chart plotter, SSB radio, AIS receiver. And transponder -thanks to our brother in law. We’ve been updating Konami’s interior, electronics, rigging and sails. She has custom made teak doors in the main cabin hatch, rudder fairing modification that enables us to sail faster, and beautiful fiberglass cap rails, with teak eyebrows that any female would envy. The custom modifications were done by Dave King. The ultimate goal is to sail as fast as possible. We are just about there – sailing on the Columbia river with full sails and poled drifter. 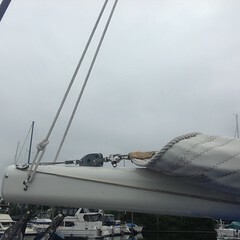 And we were nearly loaded from an ocean voyage to the San Juan Islands. 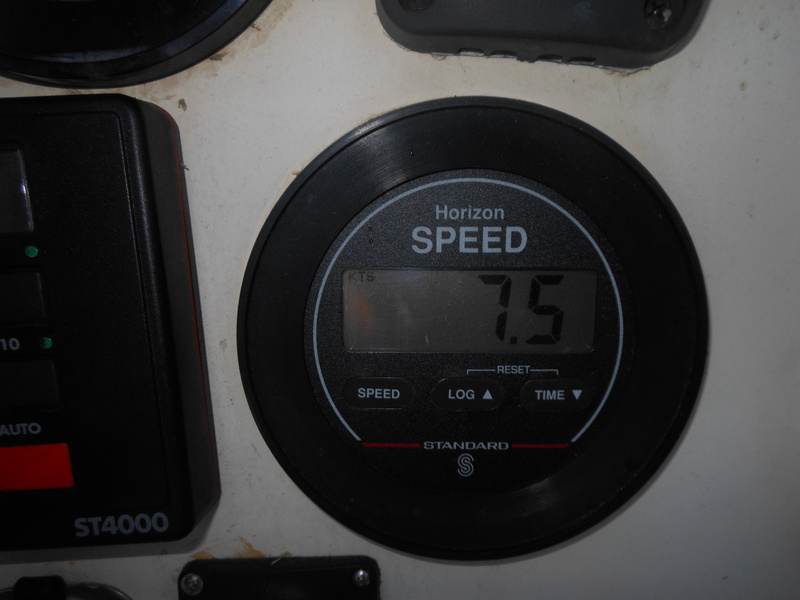 We had about 15 kts of wind. 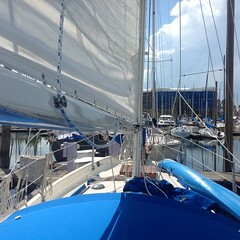 The Westsail is designed for blue water cruising, safely taking us across the oceans. 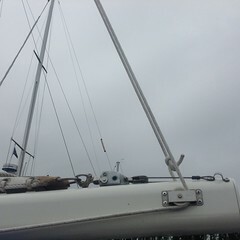 Full keel, 20,000 pounds that includes 7,000 of lead ballast for stability, immense amounts of storage space for food, boat spares and lots of other items that can’t be found when you want it, but life will be comfortable on a long voyage. Enough cooking and eating space to feed a crew and several guests if the chef feels like it, sleeping space for six but you gotta like each other, A LOT, and not be too tall or wide. Oh, we sold my beautiful, long eyelash cows, John’s beloved sailplane, our land home, cars and junk (traded in for a dinghy); and we had to work some OT at the office, but Konami is well loved, dressed and ready to go!